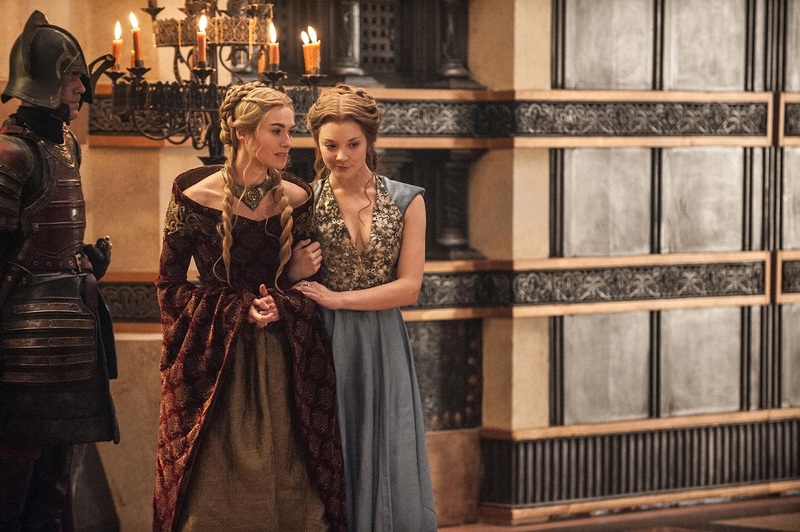 SPOILERS: Don’t read this review if you have not yet seen or don’t want to know details from this episode of Game of Thrones. Never were such devious “sisters”- LOL! 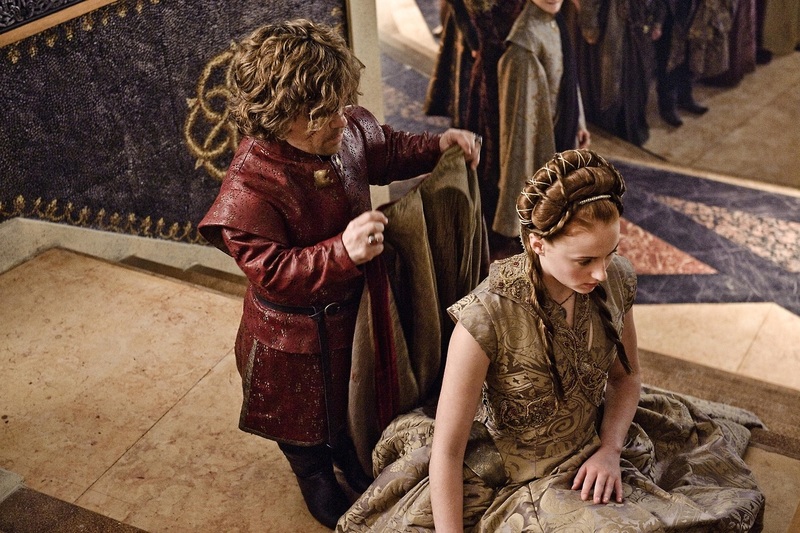 Since Joff took away the step stool, Tyrion (looking so forlorn) had to ask Sansa to bend down during the cloaking. Notice how one glare from Tywin hushed up the guests? We know who’s really in charge! Tywin (who doesn’t change his dark clothes) is disgusted once again by his son’s behavior. He expounds on duty, telling Tyrion that he must have a child with Sansa ASAP. 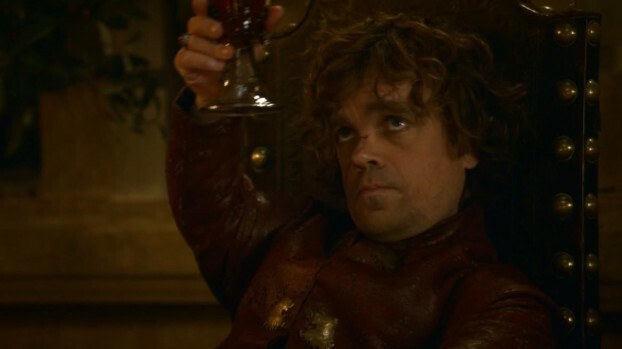 But when Tyrion lashes out at Joff (a no-no), Tywin calmly comes to his son’s aid. This scene was very well done! 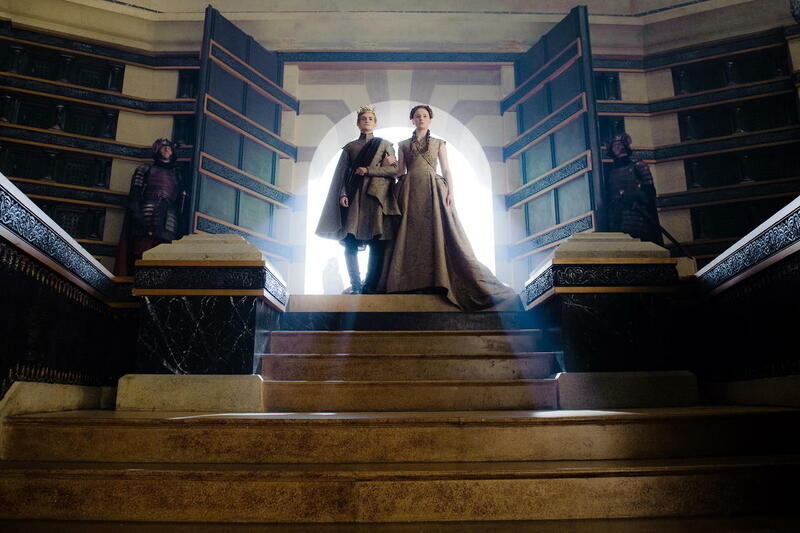 After the wedding, Sansa and Tyrion go off to his chamber. Tyrion admires and comments upon her long neck. He’s shocked to learn that she’s only 14 (though Sophie Turner is actually 17). He decides that he doesn’t want to be with her until she agrees. Peter Dinklage- what MORE can we say about his talents!? 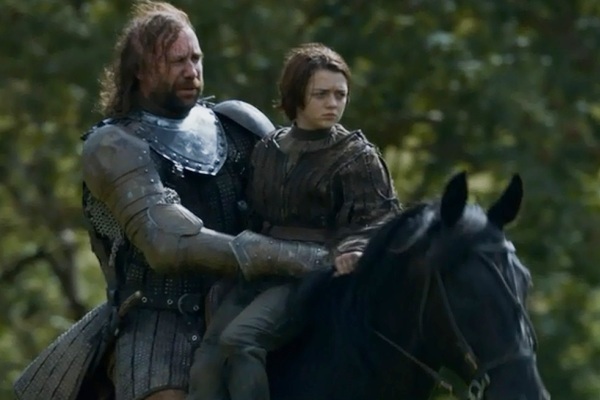 Arya learns that The Hound is taking her to relatives. Arya tries to bash in his head w/ a rock, but The Hound is actually trying to help her. He tells her that he’s taking her to The Twins (where her uncle will soon be wed to one of the Frey girls) and not to King’s Landing. 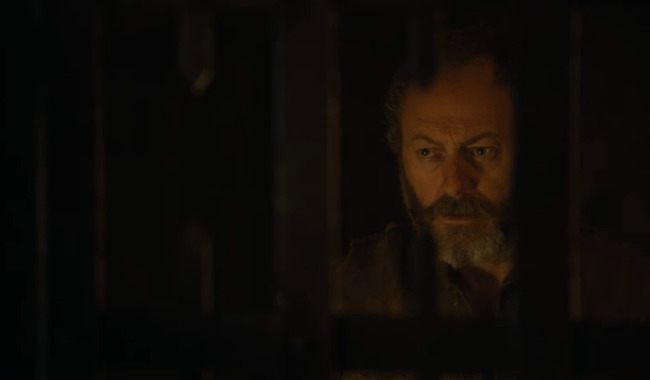 Even behind bars, Davos is a great counselor. 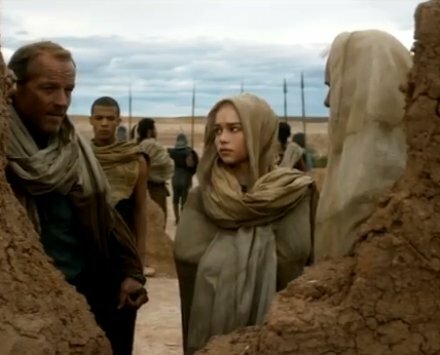 Finally, we get to see Ser Davos (how I missed him)! I love how he’s learning to read, too. Stannis, who (deep down) doesn’t want to see his kin dead, goes to get Davos’ opinion. Melisandre wanted to kill the young blacksmith- a sacrifice to The Lord of Light. The Onion Knight talks freely w/ his lord, unafraid of the consequences. Stannis listens to Davos, as he respects and trusts him. 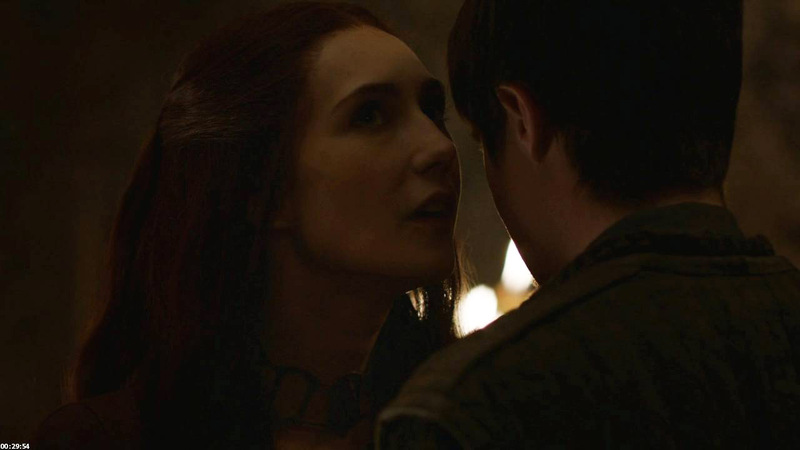 Melisandre gets her leeches into Gendry- EWWW! The Mel and Gendry seduction scene was also very well done. (I liked Joe Dempsie’s low-key approach.) Gendry is the ordinary man put into a very weird situation b/c of his parentage. I was quite worried for Gendry for a minute there! 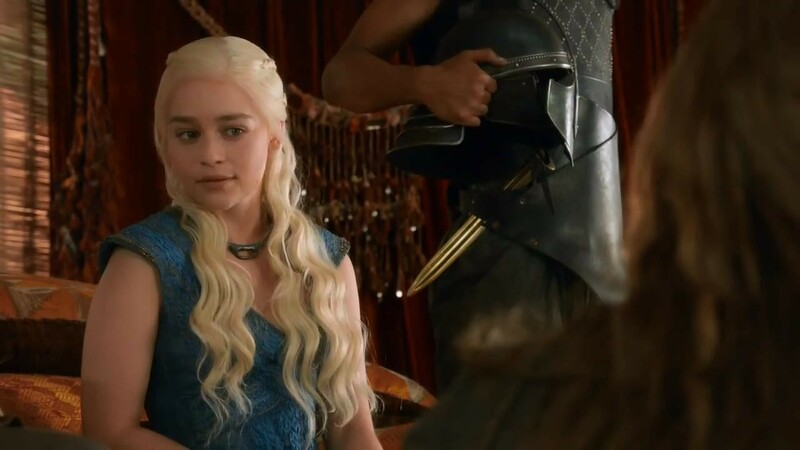 Dany and Daario have GREAT chemistry already! Daario does what he likes, we learn. Dany has a new ally (and perhaps more?) in Daario. Dany’s story takes an interesting turn- she meets three leaders of The Second Sons, who command 2,000 skilled sellswords. 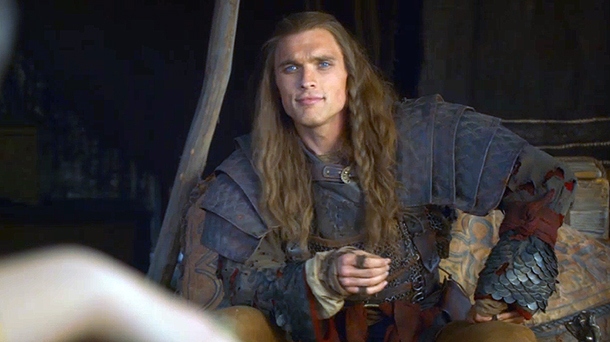 One of the finest warriors, Daario Naharis (Ed Skrein), is young, handsome, and very confident. Later that night, he presents her w/ the heads of the two leaders who wanted her dead. Instead of killing her, he pledges himself to Dany. (This actor’s looks and demeanor remind me of Jonathan Rhys Myers.) Dany gets out of the bathtub and reveals herself to him fully. This is a power move, not only a show of romantic interest.